Whether you are investing in commodity funds, hedge funds or green funds, markets can be erratic. The graph below shows the advantages of saving a regular fixed sum in a volatile market over the short to medium term. This comparison shows the value of two unit holdings over a 10 year investment term. At first glance, Situation ‘A’ appears to provide better fund performance over Situation ‘B’. However on closer inspection the benefits of unit price fluctuation become clear. Under normal market conditions the stock market will always deliver fluctuating returns. 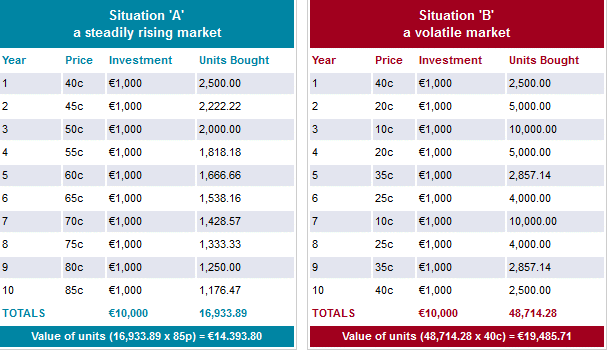 As the market weakens, the investor is able to purchase more units for the same €1,000 premium contribution. These additional units thereafter accrue in value as the market swings upwards, much to the benefit of the portfolio. The example demonstrates the advantages of saving in a fluctuating market in a 10 year savings plan; the investment return is greater for Situation ‘B’ despite the unit price being lower at the end of the investment term than that of Situation ‘A’.